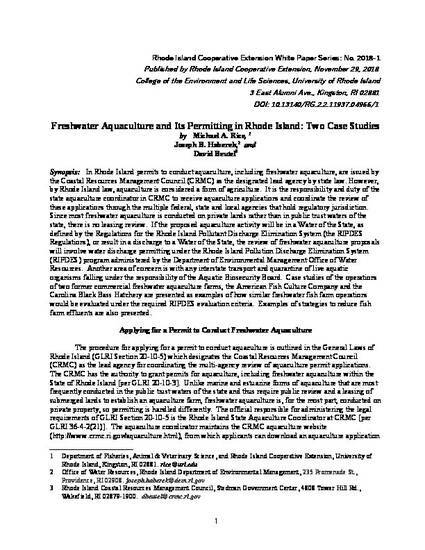 In Rhode Island permits to conduct aquaculture, including freshwater aquaculture, are issued by the Coastal Resources Management Council (CRMC) as the designated lead agency by state law. However, by Rhode Island law, aquaculture is considered a form of agriculture. It is the responsibility and duty of the state aquaculture coordinator in CRMC to receive aquaculture applications and coordinate the review of these applications through the multiple federal, state and local agencies that hold regulatory jurisdiction. Since most freshwater aquaculture is conducted on private lands rather than in public trust waters of the state, there is no leasing review. If the proposed aquaculture activity will be in a Water of the State, as defined by the Regulations for the Rhode Island Pollutant Discharge Elimination System (the RIPDES Regulations), or result in a discharge to a Water of the State, the review of freshwater aquaculture proposals will involve water discharge permitting under the Rhode Island Pollution Discharge Elimination System (RIPDES) program administered by the Department of Environmental Management Office of Water Resources. Another area of concern is with any interstate transport and quarantine of live aquatic organisms falling under the responsibility of the Aquatic Biosecurity Board. Case studies of the operations of two former commercial freshwater aquaculture farms, the American Fish Culture Company and the Carolina Black Bass Hatchery are presented as examples of how similar freshwater fish farm operations would be evaluated under the required RIPDES evaluation criteria. Examples of strategies to reduce fish farm effluents are also presented.